Scotland will remain part of the United Kingdom after rejecting independence. Some 2m people voted against plans to leave the union, while 1.6m voted in favour. The outcome was known at 6.08am this morning and the turnout was 84.51%. For the thousands of people living just miles either side of the border this is a historic day that could have dramatic implications on the North East of England's economy, political and social life. We'll be bringing you reaction throughout the day. Good afternoon. After two years of campaigning, today is the day that people across Scotland decide the fate of their nation in the referendum on independence. Our reporter Kate Proctor is on her way to Northumberland's border with Scotland where she will be bringing you the latest reaction from voters as they place their cross in the YES or NO section of the ballot paper. People have been voting all day but when can we expect to hear the results? The 32 councils start their counts when polls close at 2200. They will report totals to the central count before declaring them locally. 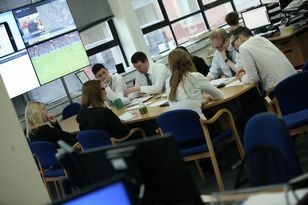 It is difficult to estimate declaration times owing to a lack of precedents but it is expected the bulk should come through between 0300 and 0500 with the final count expected to declare at around 0600. By this time the overall outcome should be clear. There will be an official announcement some time later by Chief Counting Officer Mary Pitcaithly at the central count centre at the Royal Highland Centre in Ingliston outside Edinburgh. Our reporter Kate Proctor is driving through Northumberland towards the Scottish borders - what do you think the outcome will be? Driving through Northumberland, an area which could be greatly affected by #indyref. It's raining and a bit bleak. Sunshine at the border? According to the Daily Record researchers at Oxford University did a study of referendum tweets today to decipher what proportion of social media was behind a Yes vote. Using their software, they established that 82 per cent of tweets from a sample of 40,000 shared a positive message for independence. Our reporter Kate Proctor says: "We're hearing farmers in the borders in the NO camp. Fears over leaving the EU. Scotland has a lot of countryside! A powerful voice indyref." Whatever the result tonight, change is on the way. A Yes vote will throw the rest of the UK into a full-scale constitutional crisis. Let's take a look at the probable timetable of events for both outcomes. 10pm, tonight - Polls close after a final day of fevered and frenzied campaigning across Scotland. 2am, Friday - First result declared, in the distant Western Isles. A big win for Yes is a sign of things to come. 3am, Friday - Pro-union stronghold of Dumfries & Galloway declares. A ‘Yes’ vote here means Alex Salmond is on the road to victory. 5am, Friday - Crunch moment as Glasgow and Edinburgh declare. If Scotland’s two largest cities both choose independence then the union is lost. 5.30am, Friday - David Cameron calls Alex Salmond to concede defeat. 6.15am, Friday - An ashen-faced David Cameron addresses the nation from 10 Downing Street after the final result is declared. Parliament is certain to be recalled - possibly as soon as Saturday. 6.30am, Friday - A jubilant Alex Salmond flies into Edinburgh in a helicopter from his Aberdeenshire constituency. Expect wild scenes on the streets of the capital and a call for unity among Scots from their new leader. 7am, Friday - Emergency meeting of Treasury officials in Whitehall to consider ramifications of splitting apart the nation. 8am, Friday - Stock markets open. Prices likely to tumble and shares in the pound plunge as shockwaves reverberate through the markets. Scottish ATMs have been stocked for a possible run on the banks by nervous Scots. 9am, Friday - MPs will begin to call for the Prime Minister to resign. Labour Party must decide whether to cancel or curtail their annual conference, due to get underway in Manchester in 48 hours’ time. Saturday / Monday - Parliament will be recalled and the blame-game begins in earnest. Furious MPs of all parties will point the finger at Cameron and his inept handling of Scotland. Tuesday 23rd - Ed Miliband due to make his leader’s speech at Labour Party conference. He is likely to call for Cameron to resign and trigger an early general resignation. Wednesday 24th - By now, angry Tory backbenchers will be collecting signatures from party colleagues for a letter which demands Cameron resign. They need 46 to trigger a leadership contest. Friday 25th - UKIP autumn conference begins in Doncaster. Nigel Farage certain to use his leader’s speech to call for Cameron to resign. 10pm, Thursday - Polls close after a final day of fevered campaigning across Scotland. 2am, Friday - First result declared in the distant Western Isles... a big win for No will set the course for a massive night in UK politics. 4am, Friday - The pro-independence stronghold of Dundee declares. A No vote here means it’s all over and Salmond’s chance has almost certainly gone. 5am, Friday - Glasgow and Edinburgh declare support for staying part of Britain. A massive sigh of relief for Ed Miliband. 6am, Friday - A broken Alex Salmond will address the nation from his Aberdeenshire constituency. He has said he will stay on in a No vote - but the knives will be out immediately from SNP colleagues who hold him responsible for snatching defeat from the jaws of victory. 6.30am, Friday - A relieved David Cameron thanks Scottish voters for saving the union and promises Holyrood a raft of new powers in a speech from Downing Street. 8am, Friday - Stock markets open. Prices are likely to soar as fear of uncertainty in the markets disappears. 9am, Friday - The SNP will say the close-run vote shows the appetite for change in Scotland - and demands a raft of new powers from Westminster. Work begins immediately on a new devolution settlement. October 13, 2014 - Parliament returns after the conference season. Cameron tells MPs he will keep his promise of further devolution to the Scottish Parliament. He will be met with fury from some of his own backbenchers who say Scotland has blackmailed the rest of Britain. October 16, 2014 - Gordon Brown leads House of Commons debate setting out plans for further devolution. He promises a ‘command paper’ will be published by the end of the month. November 2014 - Questions of devolution dominate proceedings at Westminster. Angry English and Welsh MPs demand powers for their own regions. A Scotland White Paper is published setting out in more details plans to give Holyrood new powers over tax and welfare. January 2015 - Draft laws published offering a new settlement for Scotland. They are likely to be denounced by the SNP as insufficient. Could Nicola Sturgeon - who might be leading the party by then - demand another vote by 2020? May 2015 - UK general election. Current polls suggest Ed Miliband is on course for Downing Street. He is likely to promise a huge new devolution package for English cities to sit alongside the new Scottish laws. May 2016 - Scottish Parliament elections. Nicola Sturgeon will seek re-election as First Minister, claiming Scotland has been “betrayed” by Westminster. But could she face a challenge from Scottish Labour... led by a revived Gordon Brown? Our reporter Kate Proctor says: "There's four and a half hours until polls close at 10pm. There's already expected to be a record turnout with 97% registered to vote. "No doubt there will be a big surge around tea time as voters go to the polls after work. The weather in the borders this evening can only be described as drab; it's very misty, pretty gloomy to be honest. "No last minute signs of union campaigning in Northumberland as yet. In fact the only flag I've seen is an Italian one above a restaurant." Our reporter Kate Proctor has arrived at her first destination - Coldstream. She says: "The key area people in Northumberland should care about is the Scottish Borders Council's administrative area. This is Coldstream, Melrose, Kelso, Eyemouth, Paxton, Foulden, Chirnside for example. "The vote tonight is expected to come in at 5am, the same time as Edinburgh and Glasgow, by which point the result of the referendum could be clear. Some have said Scottish Borders has traditionally been in the No campaign. But we'll head to the polls to find out people's feelings today. "The first results tonight are expected at 2am from the north of Scotland, including the Orkney Islands and the Western isles. Finally, some outpourings of emotion in Northumberland. "One farmer is flying the English and Scottish flags alongside the Union flag!" Andy Murray has backed Scottish independence. The Scottish tennis ace broke his silence saying he would play tennis for an independent Scotland. There is four hours left until the voting polls close in Scotland - will it be YES or NO? Our sister paper in Scotland the Daily Record reported earlier that over £30,000 an hour has been bet on the referendum since the polls opened according to Ladbrokes. The bookies report record-breaking business levels for a non-sporting event with the vast majority of the bets (79%) still in favour of a breakaway, forcing the 'yes' odds in slightly to 10/3 from 7/2. No remains the odds-on favourite but eases to 2/9 from 1/5 with political punters also keen to back a turnover level of over 90% at 5/1. Ladbrokes will be taking bets on the outcome of the referendum and associated markets until a result is announced. Alex Donohue of Ladbrokes said: "The volume of referendum bets is only getting greater as the day goes on. 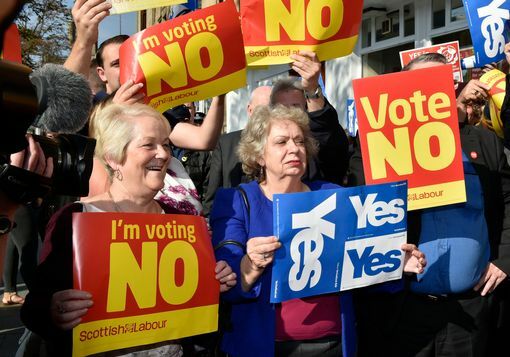 As has been the case for the last few days, a 'yes' outcome is still all the rage." He added:"We've never known anything like it for a non-sporting event. Just like both campaign leaders, when it's all over we'll definitely need breather." Our reporter Kate Proctor is now going to take over the blog live from Berwick where she'll be bringing you all the latest as-it-happens news and analysis. NEWS: It's not just Berwick swirling in heavy mist. Lifeboats were on standby in the Western Isles tonight after fog threatened to ground planes taking ballot boxes to the count. Thick fog in the islands was threatening to ground tonight's count because the plane may not be able to land at Stornoway - where all the isles' votes will be gathered. It is the only plane that is being used to carry votes in the whole of Scotland. NEWS: Jasmin Hall, 18, from Coldstream voted NO this morning and said both yes and no campaigners were both outside the polling station and she also had leaflets put through the door first thing. She said: "I just feel like there's more consequences to independence than there could be benefits. I'm going to an English university next week and I would be really worried about how much finance the universities in Scotland would get because a large amount comes from England. I'm worried about how banking would work." NEWS: Elaine Housby, a Berwick resident for the past five years, said: "I don't want to live in a town inhabited by affluent retired people and Scots practising tax avoidance." She said while she was sympathetic to the Scottish yes campaign she is worried about a closed border. "I think the British would benefit from any degree of devolution, but devolution that stops short of them closing the border." NEWS: John Brassington, 71, from Berwick, said: "If they vote yes it's an earthquake to hit Scotland." He said is from Donegal in Ireland originally and said no divided nation is a good idea. "We are so much better together."